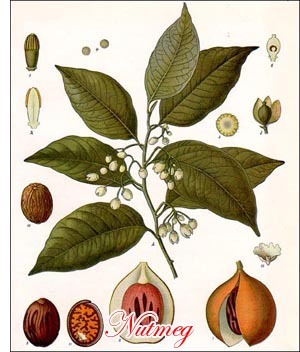 The Nutmeg is the spice obtained from a medium-sized evergreen tree reaching a height of from twenty-five to forty feet. The male flower consists of a column of from six to ten stamens enclosed by a pale yellow tubular perianth. The female flowers occur singly, in twos or threes, in the axils of the leaves; they also have a pale yellow perianth. The ovary has a single seed, which finally matures into the nutmeg and mace. The mature seed is about one and one-fourth inches long and somewhat less in transverse diameter, so that it is somewhat oval in outline. It is almost entirely enveloped by a fringed scarlet covering known as arillus or arillode (mace). The entire fruit, nut, mace, and all, is about the size of a walnut, and, like that nut, has a thick outer covering, the pericarp, which is fibrous and attains a thickness of about half an inch. At maturity the pericarp splits in halves from the top to the base or point of attachment. The leaves of the nutmeg tree are simple, entire, and comparatively large. The nutmeg is now cultivated in the Philippines, West Indies, South America, and other tropical islands and countries. The botanic gardens have been largely instrumental in extending nutmeg cultivation in the tropical English possessions. The trees are produced from seeds. After sprouting, the plants are transferred to pots, in which they are kept until ready for the nutmeg plantation. Transferring from the pots to the soil must be done carefully, as any considerable injury to the terminal rootlets kills the plants. A rich, loamy soil with considerable moisture is required for the favorable and rapid growth of the plants.